With the advancement in digital communications since 1990’s and years of tests, airlines are now facing some mandates for digital communication. Starting 2014, if you plan to fly above FL-285, your aircraft needs to be capable of Controller – Pilot Data Link Communication, or CPDLC, which is essentially using text messaging between aircraft and Air Traffic Control instead of radio voice communications. A newer version of CPDLC called PM-CPDLC, or Protected Mode CPDLC, will be implemented in Europe between 2013–2015 and, with the exception of exempted aircraft, will be required for operation above 28,500 feet (FL 285). The PM-CPDLC features improved data integrity and ensures messages are delivered to the intended aircraft. It is a newer and higher-speed data link service that uses the Aeronautical Telecommunications Network (ATN) network and protocol with VHF Data Link (VDL) Mode 2. CPDLC, in conjunction with Automatic Dependent Surveillance-Contract (ADS-C), enables the use of FANS 1/A over oceanic airspace. 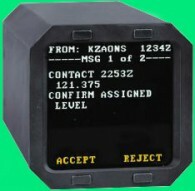 FANS (Future Air Navigation System) uses the Airport Facilities Notification (AFN) protocol over existing Aircraft Communication Addressing and Reporting System (ACARS) network via VHF and Satcom and enables transoceanic navigation closer to other aircraft than previously permissible. Simply put, if you intent to operate in Europe airspace above FL 285, you need PM-CPDLC by mid to end of 2014. If you don’t upgrade, then starting 2015 you will max cruise ceiling will be FL-285, so will have to add about 10 to 15% more fuel burn to your flight plan !